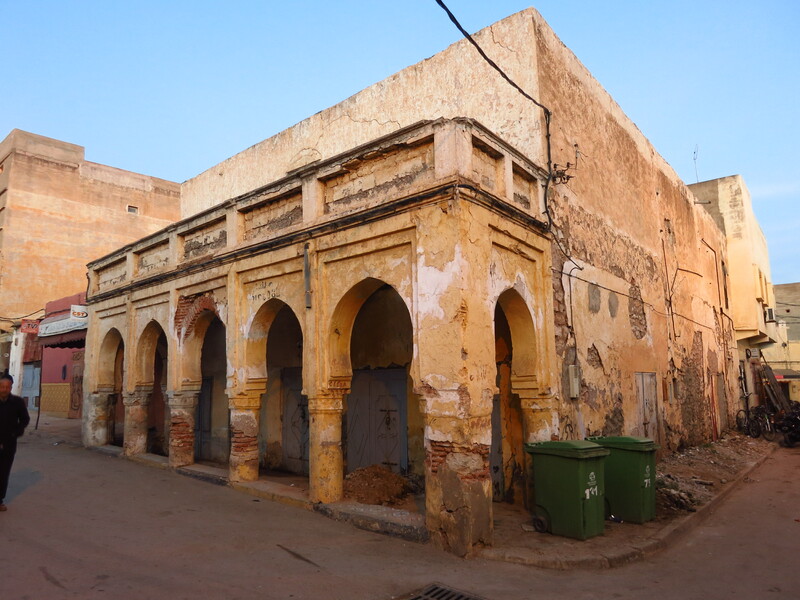 After the Marrakech experience, we had decided that it would be best to avoid big cities, so instead of spending the next night in Beni-Mellal we found a riad in a small town called Kasba Tadla, 30km further north. Even so, we had a shorter ride today, so for the first time on the trip we were going to stop along the way to visit something instead of just seeing the country from the motorbikes. We left the narrow streets of the old town in close formation and dived into early morning traffic without having breakfast, as it was not included and our bohemian writer wanted to charge way too much for it. As I joined the main avenue leaving the city the two other bikes fell a few cars behind me as they entered one of the roundabouts, so when I saw a petrol station a bit further ahead I pulled up, waited until I saw Gerard’s headlights and rode to the pumps. When I got off the bike I saw that Esteve was not there. I asked Gerard and he said the he had just him right behind a moment ago. We waited a bit, but it seemed that he might have not seen us and gone on. I went up ahead but did not see him, and he had not turned up at the petrol station, where Gerard had been waiting so, just in case, we went back to the last roundabout to make sure nothing had happened. It was clear that he was ahead of us, so he was bound to stop when he saw he was riding alone. 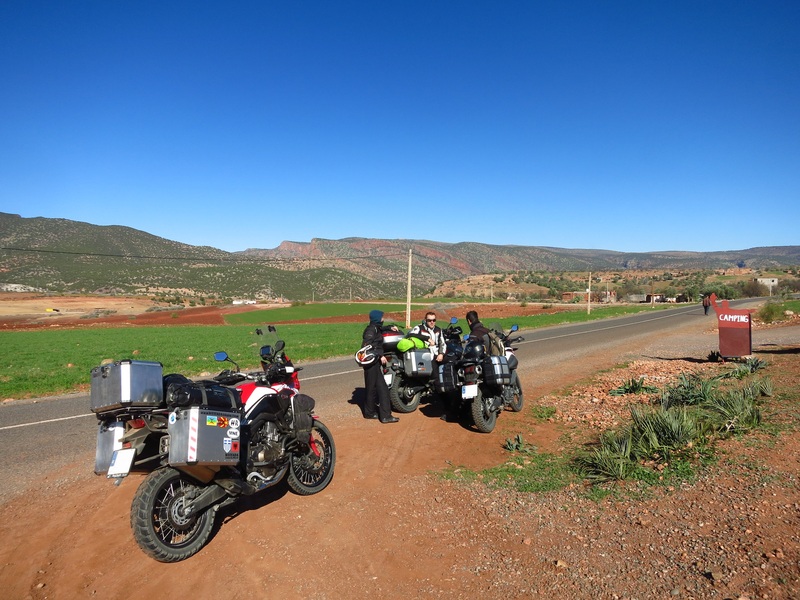 We decided to go on to the intersection where we were going to leave the national road to start our scenic route, about 7 kilometres out of Marrakech. 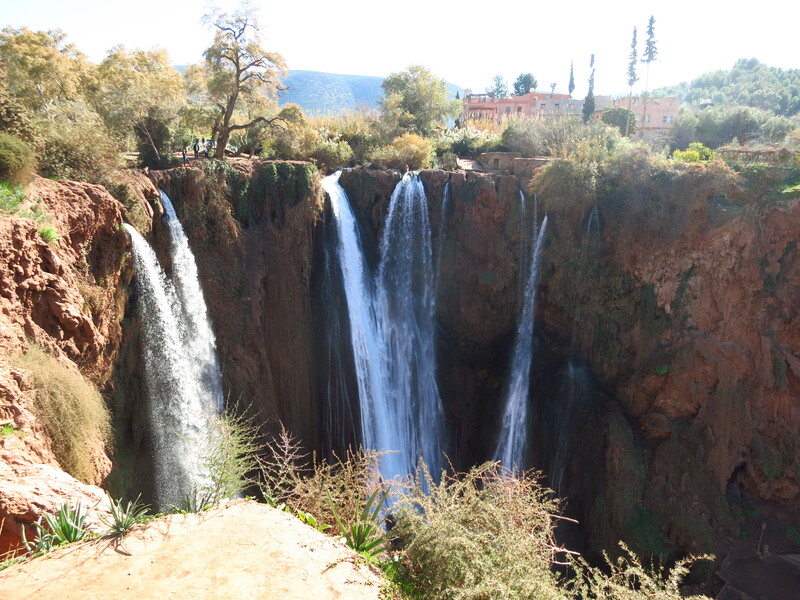 He was not there either and, while we were debating what to do, we got an SMS from him, saying that he was fine and that we would meet at the Ouzud waterfalls, halfway to Kasba Tadla. We found him standing by the side of the road, looking happy to have enjoyed a whole morning of riding with the road all to himself, leaning against his bike and listening to a guy telling him about two houses, his wife and how he used one for himself and kept the wife in the other. We reached the waterfalls quite fast, and started the usual ritual in tourist sites – have people pointing you into car parks, choosing one, paying the guy who said he was going to take care of your bike, say no to a few more guys offering to show you around, find the way to what you want to see and go. Despite the 2-hour tours offered by the locals, the waterfalls were five minutes away from the car park. I had been expecting to find them at the end of a narrow gorge, but in fact the footpath led instead to the top of the waterfall, and the gorge was at our feet. There were three different waterfalls pouring water into the river below, and by the looks of the terrain, there might be quite a few more when it rains. We walked around the top of the waterfall to get a different perspective and then back to the car park to continue our journey. 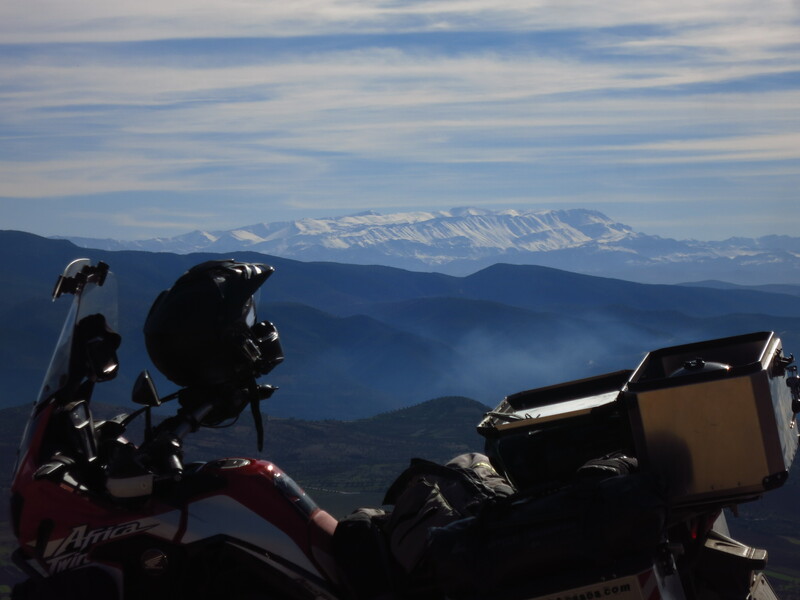 It had felt nice to stretch our legs for a while, even if it was in motorbike clothes, and now the road was nice and the day was warm, so we had a good time on our way back to the national road. We still rode on very small roads for a good while, including climbing a series of tight hairpins on a road that was not even on our paper maps. Things changed when we got back on the national road, though, and despite only having a relatively short short distance to our destination, the traffic was heavy and the road monotonous, so we were really looking forward to the end of the day. The road had other intentions for us, though, and before Kasba Tadla we still had to cross Beni Mellal. Maybe it was because we were already feeling tired, but crossing this city felt longer than any other, and we were especially glad to reach our destination. 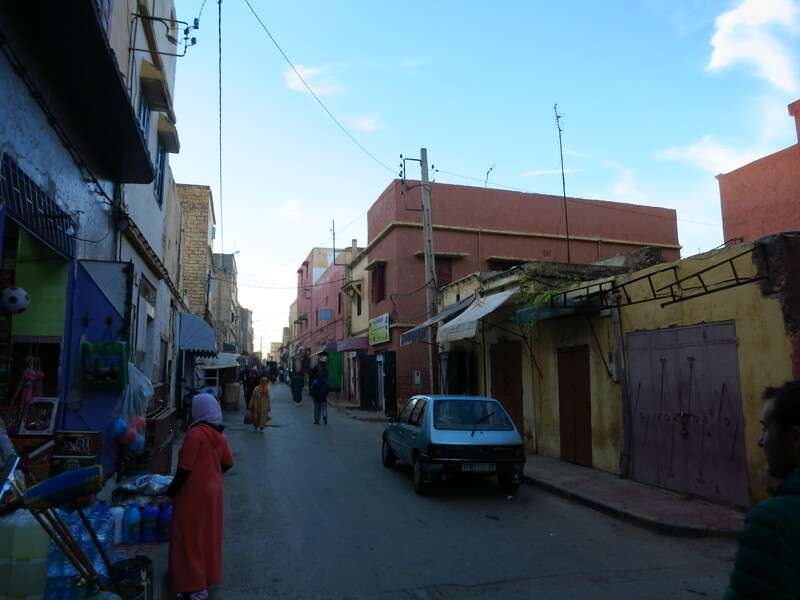 Kasba Tadla looked small and friendly, there was little traffic and we found our riad straightaway. 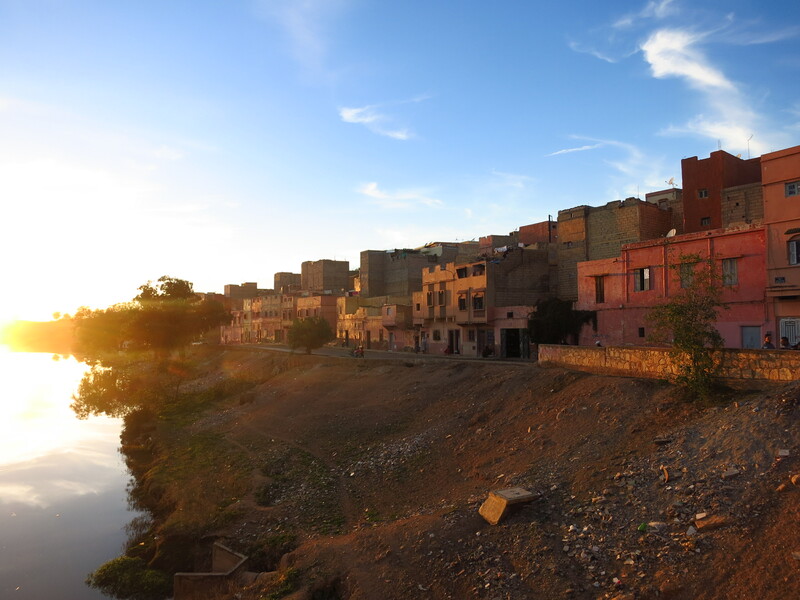 I liked the place, and after Marrakech, I really appreciated the friendliness of our host. We parked the bikes inside the riad, unpacked, had a shower and since we still had a couple of ours of sunlight (a first this trip) we went out to explore the city. It was immediately clear that we were not in a touristy place, and it was a welcome change after the big city. This was the Morocco we had found in Errachidia, a real taste of the country. 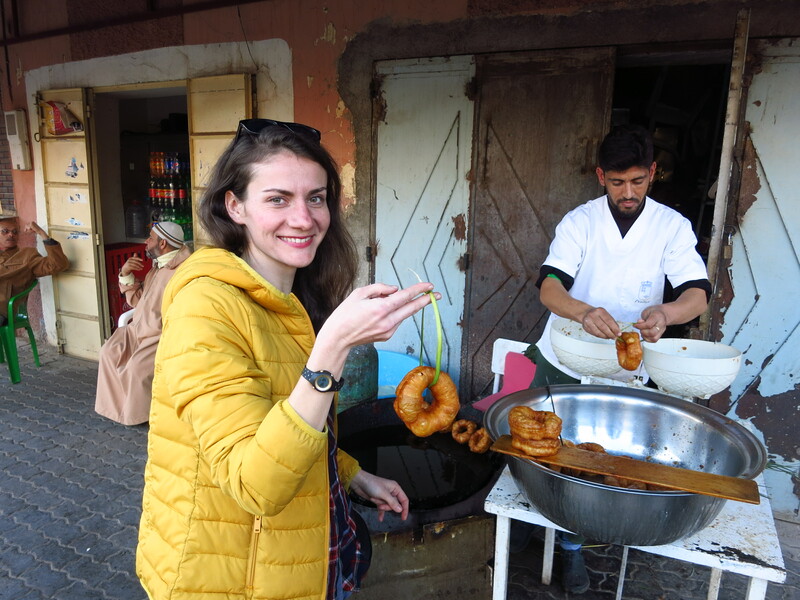 We went to the market and it was the complete opposite of Marrakech – it was a small place, with locals going about their business and doing their shopping, and no one was trying to sell us anything. In fact, we were the tourist attraction there, everybody had eyes on us. I saw a small shop that sold accessories for the scooters and mopeds that are seen everywhere around the country, and went to try to find a country sticker for the motorbike. The boy behind the counter did not speak French, English or Spanish, but after some pointing and gesturing he understood and produced a sticker from behind the counter. It was a lot nicer than the glittery ones that I had found the day before and that seemed to be the only option available in the whole of Marrakech and shaped like a waving flag, so it would fit nicely in a gap between Bulgaria and Kosovo that was too small for a regular one. Gerard and Ralu had been wanting to get some spices for a while, and they found a greengrocer who had been living in Spain and who told them about the different types. Back in our riad, we had dinner and got some tips about things to visit the following day from our host, who also had beer. 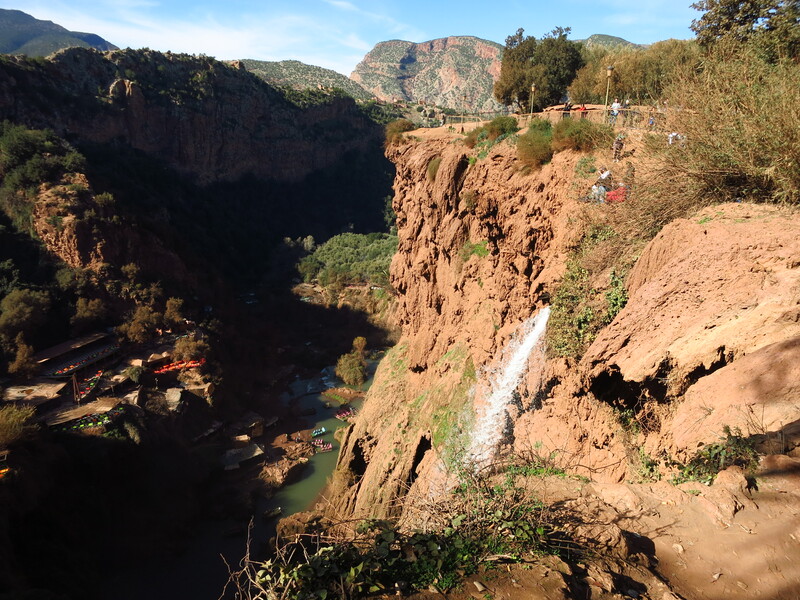 This entry was posted in Moroccan Christmas 2016, Travel and tagged Beni Mellal, Honda CRF 1000L, Kasba Tadla, Marrakech, Morocco, Ouzud waterfalls by Kilian. Bookmark the permalink.